the 1570s BCE, that is. Allah and Earth pardon sin, but remaineth forever remorse.” R. Kipling. When General James McKendrick confronted him, Major Edward O’Neil swore that he had been joking. His fellow officers, however, had their doubts. It began innocuously enough one night at supper when Commander Na Gael joined the others in trying to identify the mystery meat. It was Lent, and Friday, so most guesses centered on fish or seafood. “Maybe lobster,” Major Maria de Alba y Rodriguez speculated, drawing laughter. Ask not for whom the cat texts, Captain Oblivious. He texts for thee. 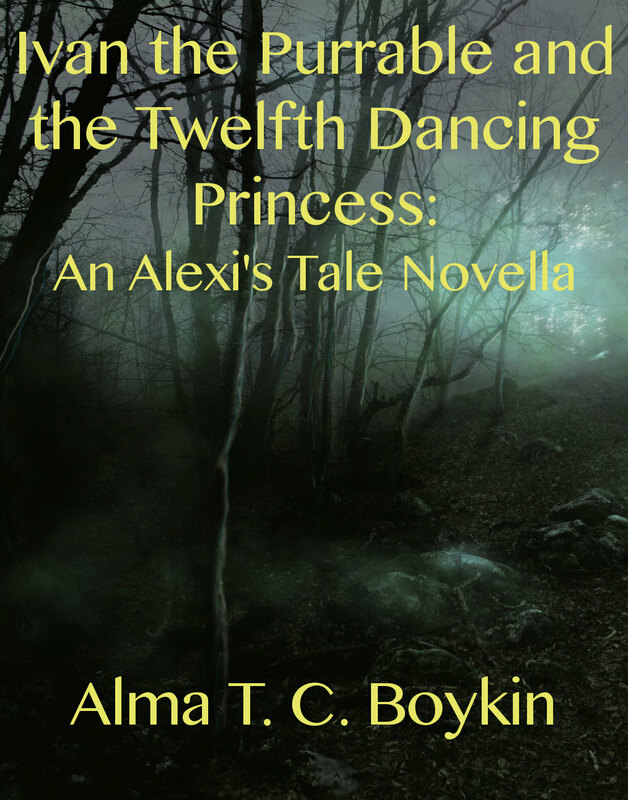 Ivan the Purrable and the Twelfth Dancing Princess is now available on Amazon. In Russian tales, the third son is the clever one, the hard-working one, the one who gets the victory, the girl, and usually a kingdom. And then there’s Steve . . .
Stavros George doesn’t believe in Baba Yaga or Chernobog. Steve believes in structural engineering, materials science, and that people need to tip their pizza delivery guys more. Too bad for Steve that Baba Yaga and Koschai the Deathless believe in him. It will take all three of Alexi’s children’s bravery, strength, and wits, and Ivan the Purrable, to get out of this mess. And Steve had better hope his siblings reach him before Ivan does. Because there’s no tuna in Chernobog’s realm and Ivan’s seriously ticked. It speaks volumes about the state of the world that neither the attack on the McDonald’s and the mall in Munich, nor the horrible car bombing in Kabul, surprised me. And I suspect that if people were honest, the fact that the attacks took place did not surprise all that many people, relatively speaking. The location in Munich might have, because unless someone is really following the news from Germany and Austria that closely, or relies on sources like Britebart-England and the Gatestone Institute, they’d miss what’s been going on over there. But the fact of another follower of Islam blowing up a truck bomb, and of a shooting spree (with a firearm not legally obtainable unless one is law enforcement or a member of certain shooting clubs and then is not permitted to carry) by a young Moslem male, do not surprise us anymore. A detective, a heretic, and a redhead walked into a vampire bar . . . and it’s not a joke. The world has turned upside down, the ACLU is on the wrong side, and the good guys are in deep kimchi. And that’s before two escapees from hell pop up and make life really interesting.